With Mother’s Day right around the corner, I took inspiration from one of my mom’s favorite animals for creating my latest plush design. She loves raccoons, and I’m sure she would have one as a pet if she if could (I think I get my obsession with animals from her 😉). I made a raccoon last year, but I wanted to share a pattern that was a bit more user-friendly. 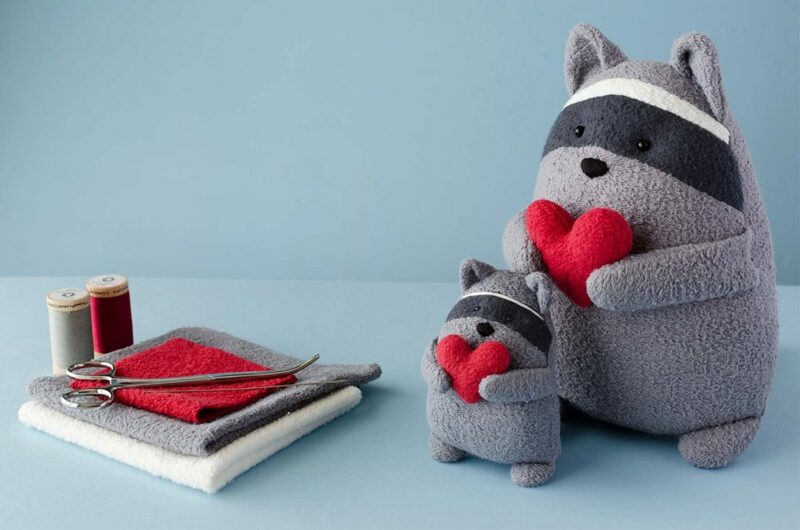 Scrabbles the Raccoon free sewing pattern is easy to sew and is available in two sizes! 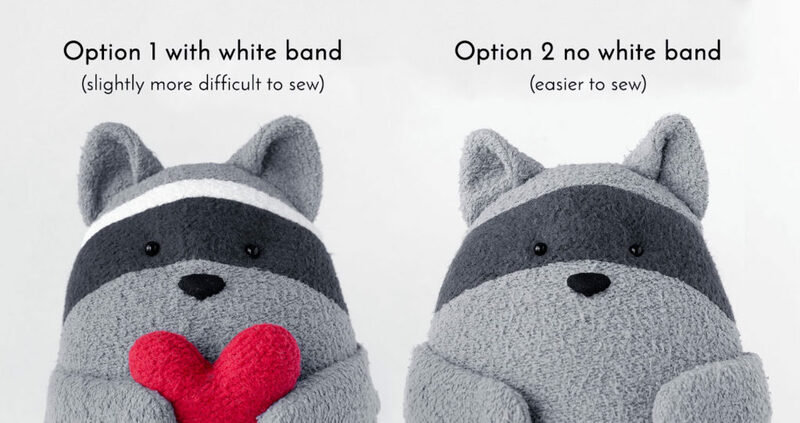 The pattern comes with two options for the raccoon face stripes. Forehead option 1, which is what I sewed for this tutorial, comes with a white band. Option 2 is slightly easier to sew but is just as cute! Fabric colors are only suggestions. Feel free to switch them up! Make a brown raccoon or give your raccoon dark arms, legs, and ears to match the eye band! If you sew your raccoon with natural fleece, I recommend using a 90/14 ball point needle; and if you sew with organic cotton thread, I recommend making your final stitch a stretch stitch (a stretch stitch is fairly permanent, so baste first when needed). Get access to the free pattern, as well as access to all my other free patterns, by clicking the button below. I find it easier to trace the stitch line for small pieces and sew on folded/layered fabric, so I’m using the arm, leg, ear, and tail pattern pieces with only the seam allowance at the very end. Line up arrows with grainline/nap direction of fabric. Trace all pieces (except the tail) and transfer all markings. For the tail stripes, cut a 1.5″ x 8″ and a 2.5 x 8″ strip from both the light and dark fabrics for a total of 4 strips. Stitch around ears and cut out. Turn ears right side out. Run your hemostat clamps around the seams. Press if needed. Baste stitch ears 1/8″ from bottom edge. Fold inner edge of ears over at indicated marking. Baste stitch again across the bottom to hold ears in folded position. Trace the stitch line for the arm and leg pattern pieces on folded/layered fabric. Stitch and cut out arms and legs. Turn arms and legs right side out. Run hemostat clamps around the inside seams to help them fully open. Stuff arms and legs about 2/3 full. Baste the leg and arm openings closed 1/8″ from edge (optional). Pin top of raccoon head (piece 4 or “alternate top of head”) to the top and stitch with 1/4″ seam allowance. Trim the seam allowance of bands to 1/8″ and finger press open. With RIGHT sides together, stitch front of raccoon to back piece around U shape, leaving the openings for ears and arms. Insert the the ears, arms, and legs in positions shown in “inside view.” Make sure the insides of the ears are touching the body side with the face, and make sure the folded edges of ears are facing the center. Stitch arms, ears, and legs in place. Baste the seam allowance around the opening. Clip curves and corners, and turn raccoon right side out. Stuff the body firmly and close with a ladder stitch (here’s a video tutorial on how to ladder stitch). If you haven’t already, make the eyes and nose. If you’d like to needle sculpt your eyes, here’s a video tutorial. And here is a tutorial for using glass beads for eyes. Stitch tail strips together with 1/4″ seam allowance (dimensions for strips are under “tracing the pattern”). Keep the two narrow strips toward the center and the wider strips on the on the outermost sides. Fold fabric and trace stitch line of tail. Use pins to ensure the stripes are lined up properly before stitching. Stitch around tail and cut out. Flip tail right side out. Stuff all the way to the end and fold the 1/4″ seam allowance toward the inside. Trace heart on folded/layered fabric and stitch around heart, leaving indicated opening for turning. Flip right side out, stuff, and close with a ladder stitch. Attach heart to paws using a ladder stitch. 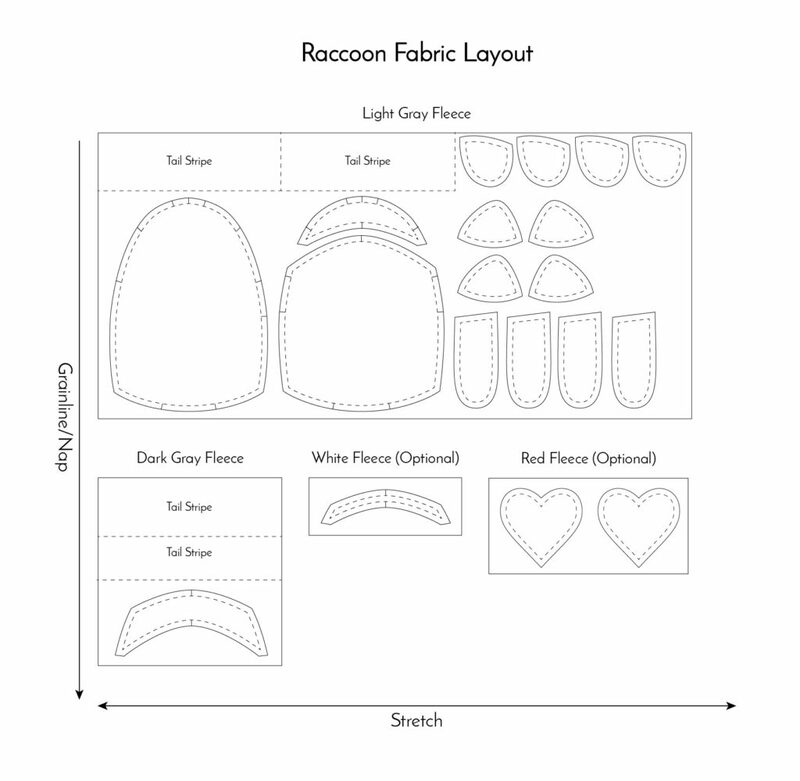 The tiny raccoon pattern does not include a seam allowance due to the number of small, detailed pieces. You will need to trace the stitch line for all pieces then add in your own seam allowance. Stitch the curves by hand or at least baste by hand before stitching on the machine. Use only embroidery for the eyes and nose. For the tiny tail stripes, cut a 1″ x 4″ and a 1.25″ x 4″ strip from both the light and dark fabrics for a total of 4 strips. 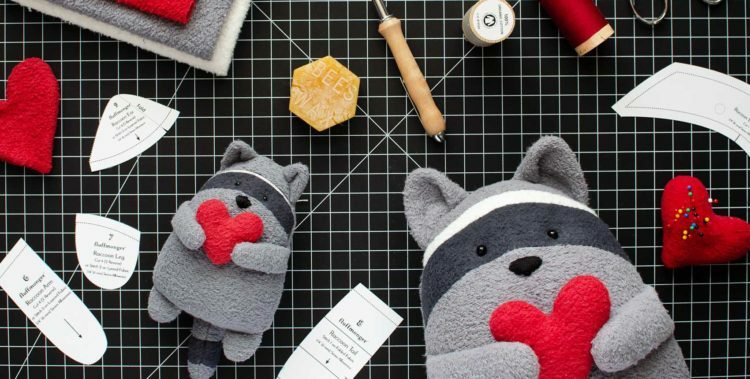 If you’d like to try sewing a raccoon with organic fabric, I have fabric kits available with just the right amount of hand-dyed organic fabric to complete the project. I also have Pick 2 Kits for sewing both a full-size and a tiny raccoon. I’d love to see what you make! Share photos of your Scrabbles the Raccoon in my Fluffmonger Patterns group on Facebook! So beautiful and so sweet!!! Thank yoy very much for sharing with us! Have a nice day! Thank you very much for the Raccoon pattern. I have been looking for one for some time now. Can’t wait to get started on it. You did a great job making the pattern. Thank you so much, Peggy! I’d love to see what you make! ¡De nada! Colombia es un lugar hermoso! ¡Uno de mis buenos amigos vive en Medellín! This is so cute. Making this for my little man! I’m so glad you like it, Cathi! I hope your little one enjoys it! This is amazing!!!! I will give you ALLLL the credit!!! This was EXACTLY what I was looking for!!!! Thank you for giving the patterns free!!! I will do what I can to share your company’s name and your expertise!!! I look forward to following you and your creations and would like to support you in any way I can! Aww, thank you so much, Macie! I’m so happy you’re excited about the patterns. I hope you enjoy making your raccoon! Those are so cute! Unfortunately I can’t seem to access the free pattern. Every time I click on “Get the pattern” it leads me back to the start of the “Free Sewing Pattern” page. What do I do wrong? Hi, Janine! It’s possible your internet browser is redirecting you to the same page. I’m not sure why this happens with certain browsers, but opening the page in a different browser seems to have solved the issue for others who have experienced the same problem. Let me know if trying a new browser doesn’t solve the issue. Hi, thank you sharing the pattern! I don’t have a sewing machine so will be sewing this by hand. Would you recommend I stick with fleece? Or felt would be easier to sew? Hi, Julie! It’s really up to you. I’m partial to fleece. I use a back stitch when I hand stitch with it, and I make sure to make smaller stitches on detailed curves. I know most people prefer felt for hand stitching, so I think it’s really just a matter of preference. Thanks for your answer. I finally managed to open the link on my phone. The little raccoon is already growing 😀. I’m glad you were able to get it to work! I hope you’re enjoying your little raccoon! OBRIGADA PELOS MOLDES, EU QUERO FAZER PARA MEU BEBE E COMO LEMBRANCINHA PARA O ANIVERSARIO DELA. SEU BICHINHOS SÃO LINDOS E VÃO DAR UM TOQUE DELICADO NA FESTA DELA. Thanks, Elis! I hope you enjoy the patterns!